These Mediterranean beauties will add height, colour and sweet fragrance to your garden for years! A riot of sumptuous pink, sweetly scented flowers & luxurious evergreen foliage! Flowering all summer long, they are wonderfully exotic, yet UK winter hardy to -5C too. They are very easy to grow they literally thrive on neglect and love hot, dry weather. Supplied as 80-100cm (3-ft) tall plants, in 20cm pots. Breathtaking! Winter Hardy Standard Oleander A Riot Of Sumptuous Pink, Sweetly Scented Flowers & Luxurious Evergreen Foliage! 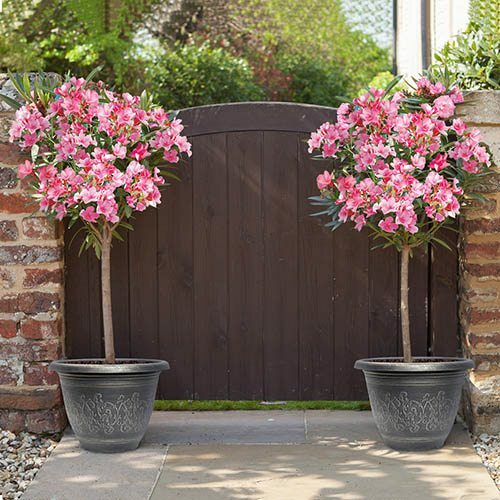 A magnificent addition to any patio or balcony, these stunning, winter hardy Standard Oleander will create a wonderful fragrance and a Mediterranean feel all summer long. Gorgeous, sweet scent from their exotic, vibrant pink blooms will gently waft through the warm air in your garden simply delightful in early evenings in the summer. Flowering all summer long, they are wonderfully exotic, yet incredibly they are UK winter hardy to -5C too. They are very easy to grow they literally thrive on neglect and love hot, dry weather. No wonder Oleander are such a big favourite with UK plant lovers! These Mediterranean beauties will add height, vivid colour and sweet fragrance to your garden for years to come. Note: We use several varieites of pink, ranging from dark hot pink to pale pink - so the exact colour you receive may vary. These trees have produced an abundance of flowers since late June. They are absolutely stunning and have received similar comments from both neighbours and visitors. As you can see they are still producing flowers into September at a time when bedding plants and other shrubs are beginning to fade. Excellent value for money! See photos opposite - thanks Peter! Supplied as 80-100cm (3ft) tall plants, in 20cm pots.